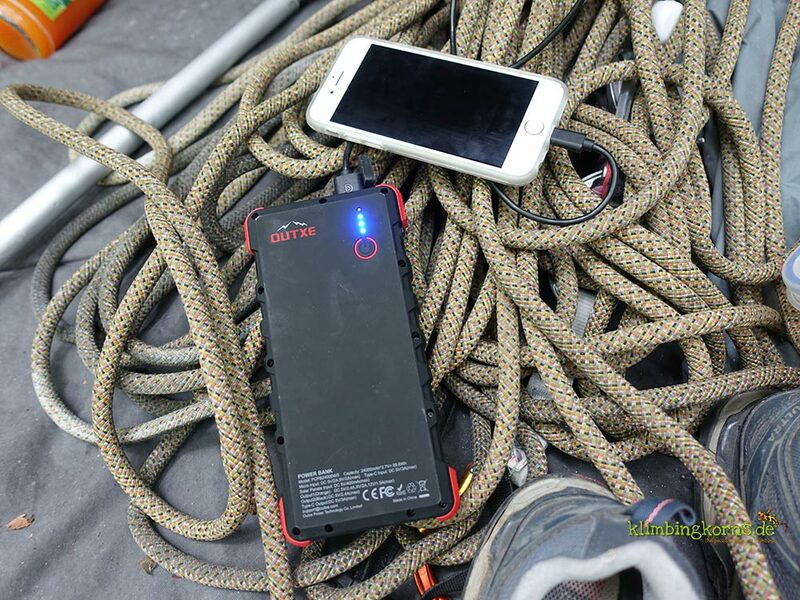 The OutXe Savage 24000 mAh is a rugged outdoor high capacity powerbank that power charges mobile devices. Even if it’s just an old keypad cellphone, at any certain point, your digital device, will need charging. Either from the socket or from a solar panel. I have been dependant on the Goal Zero’s Sherpa 50 for the last years to recharge all my devices on my road trips . However, I was looking for a stronger powerbank that would cover all my devices for preferably a week without getting fidgety. The OutXe Savage 24000 mAh came just about in the right time. 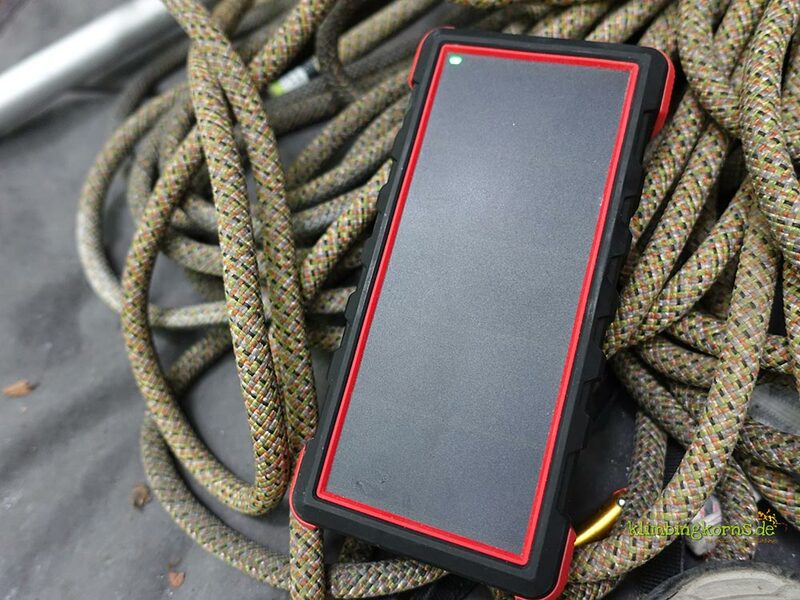 Finally, an all in one powerbank that charges and loads its power via means of solar! or socket. The powerbank comes in a rugged rubberized outfit that withstands bumps, falls, dust and rain. 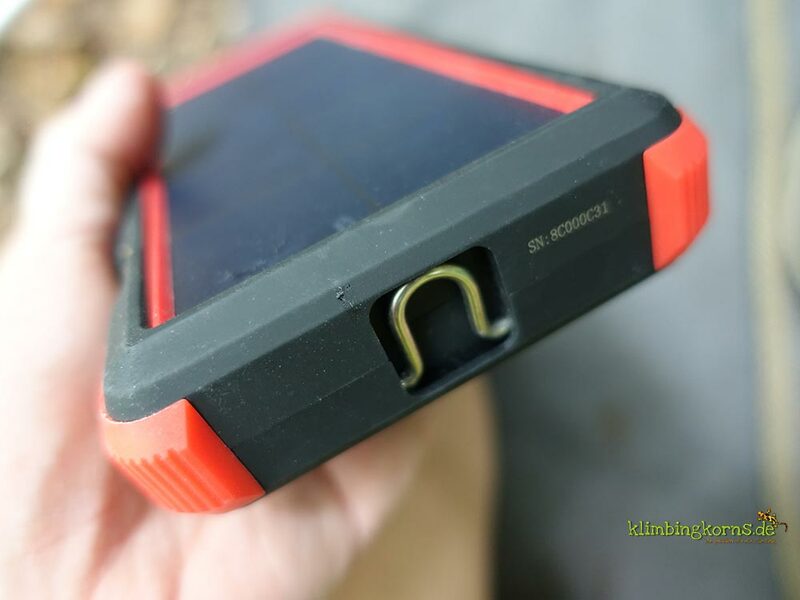 There’s a small loop for you to hook the powerbank to a tree or backpack while solar charging it. The manual says it can charge an iphone 8 times, so that’s a week of freedom before it needs recharging. 2 differant USB outputs enables you to charge 2 devices simultaneously. It supports devices that has the quick charge feature – so that they have 80% power within just 35 minutes of charging. The powerbank is 18×8.9×3 cm and weighs 548 g. This doesn’t make it a lightweight for the backpack, but I usually load my phone in the evening once we get back from curriculum of the day. So it wasn’t a problem for me. 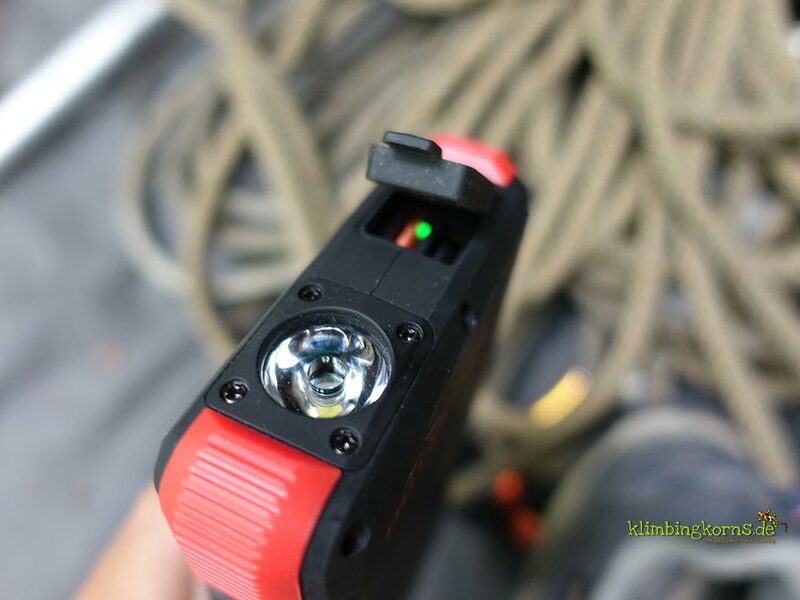 There’s a flash light in 3 different modis to choose from. Blinking, sos, and continuous mode. 4 LEDs behind the panel shows you how much power is left inside. Once you plug in the cable into the USB socket, the powerbank starts to charge automatically. However, if you have a habit of keeping the cable dangling on the powerbank without your e.g. phone, then you will have to press the on/off button four times to start loading. Charging the phone for a week became…. a whole new experience for me. After 20 mins, the phone was charged to 75%. However, I noticed that once it has reached 93% the powerbank stops charging completely. Plugging in the usb cable again would charge the phone to 100%. After a few times, it became quite annoying, since I would have to check on the phone every now and then. The integrated solar panel on the back of the powerbank is one of my main reason for choosing this product. Incase you are running low of power, you can recharge the powerbank by means of solar. Just turn it over and let it stand in the sun (cloudless!) for a few hours. Since the powerbank needs About 50 – 70 Hours (!!) (when it’s empty) to tank up completely in the sun, it’s much better to load the battery inbetween your charges, so that it doesn’t fail on you at the time when you need it most. If an electrical socket is available, you will need about 6-9 hours to tank it up. It’s better to plug it in the socket when you go to bed and it should be ready the next morning. The back of the powerbank is rubberized and integrated with 4 extra bump corners. It’s amazing what electronic is already built in a powerbank these days and it has to be protected. The powerbank is IP67 certified which means this powerbank is dust and dirtproof and will survive a dive in a sweetwater pool that’s not deeper than 1 meter. I don’t suggest you charge your devices in a river, but it is good to know that the powerbank will be fine if you leave it all alone to face thunderstorms or falls in sand or dirt. Charging in solar Modus: it’s possible to overheat the powerbank after the 4th LED lights up, This may lead to explosion if left unattended in the sun for a long time. (effects of a li-Polymer Battery, notes in the manual) So once the powerbank reaches the 4th LED light, stop charging it. heavy. Not fun to lug this around in the backpack on long journeys. You can use the powerbank to charge any device that’s chargeable with a USB – Smartphones, tablets, smartwatches, gps devices, headlamps or your camping fairy LED Lights, etc. It’s great to have a powerbank that lasts a little longer than just 2 charges. It gives you a little more freedom to plan an outdoor trip without immediately having the anxiety to have to look for a power socket after 3 days. (of course, if you load just 1 device, once a day ). The OutXe Savage powerbank costs UVP 99,99 € but there are good bargains on the internet shrinking the price to almost half. 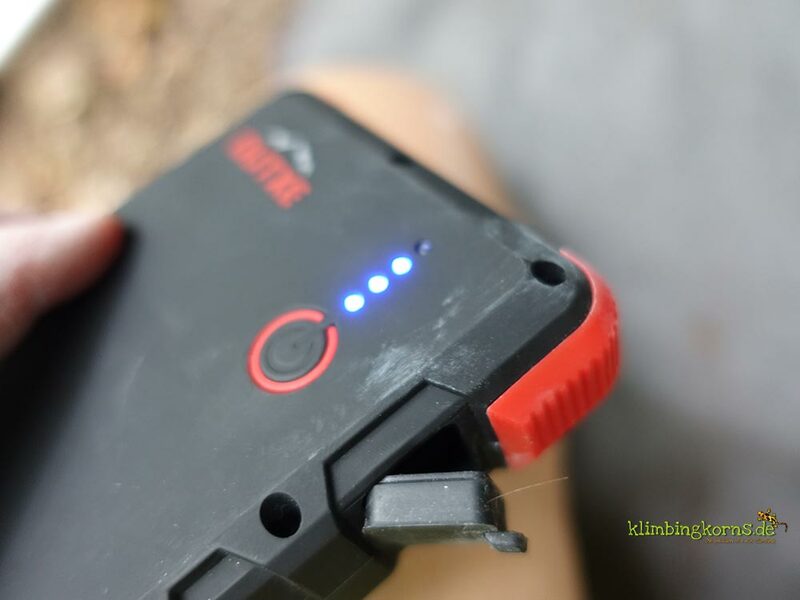 OutXe stands for “Outdoor Extreme Energy” and is an asian outdoor Lifestyle brand offering outdoor products (powerbanks, Camping lantern, waterproof bags). Their goal is to produce outdoor goods with better quality.